You can't beat this combination - FAMILY and FRIENDS together enjoying the lake and mountains. This UPSCALE log and pine home is the perfect fit for you. Sun, swim and boat from the SECLUDED private dock, gather around the lakeside campfire during the evening, enjoy the fine home amenities or retire to the lavish masterbed and bath. For a day at the slopes or a night out, the center of Deep Creek's activities, restaraunts and fun zone are only minutes away. Families and couples 28 years old and above are eligible to rent this home. The house has (2) Master Suites with Queen Beds, a Third Bedroom with a Queen. The Fourth Bedroom has a Twin and a set of Buckbeds, plus a Queen pullout in the Game Room. Our property provides the ideal lakefront for your family to enJoy fun filled days on and in the water. Our large private dock is for your use only and is located near the end of Cherry Creek Cove. The front of the dock sits in about 10 feet of water, perfect for carefree jumping and diving. Because of our position in the cove boats do not blast by the dock creating wakes or safety issues. Best of all the other side of the Cove is State Park property, free of houses, noise and lights. Evenings at the fire pit have that great backwoods feeling. House has an open floor plan, all the modern conveniences and yet the stone and wood textures create a wonderful cabin feel. Met our expectations. Would stay there again. Thanks Jay, hope to have you back. Clean, comfortable, well appointed kitchen, beautiful landscaping, plenty of space for two families. Perfection would have been achieved with a little more outdoor lighting and some comfy lounge type furniture on the deck. But overall we had a good time and really enjoyed our stay here. The landscape takes some effort, thanks for appreciating the effort. Glad you enjoyed the home. The periodic rain makes comfy outdoor furniture soggy furniture, but I think we could add some cushions. Thanks for the idea. This house is simply gorgeous, well appointed with all the comforts and conveniences of home. Lots of room to sprawl and gather, both inside and outs, and windows everywhere. We were there in summer (a nice mountain respite from humid DC) but I imagine it would be a great place to go in winter as well (Wisp is minutes away). For summer visits, the dock area is a really great addition - lots of chairs, a nice fire pit, located off the main lake so really quiet and mellow. And the owners were a dream to work with. Highly recommend! So glad you love the house and property. We're glad to give families a wonderful place to relax, enjoy and refresh. Hope to see you again. The house is very nice and has lots of great light and windows. It is a bit of a hike back up from the dock given the hill and the stairs, but at least its good exercise. We had a ton of fun and caught lots of fish right in the cove where the house sits. This was our second time staying here and I wouldn't hesitate to do it again. We're so glad you and your family enjoyed the house and property for another vacation. The distance from the house to the dock is about 275' which makes enhances the exclusive privacy of the dock and lakefront. Great place for kids to play and explore. This property worked especially well for our 2 families of adults, teens, and preteens. It was spacious, comfortable, beautifully decorated and within close proximity to the lake. The fire pit area and dock were a great place to hang out and be near the water. The house had everything we needed and the linen service was great! Steve and Eileen were wonderful to work with and made sure we had everything we needed for a great week of fun. We will definitely be back! We loved this house! We wanted a winter, long weekend get-away for two families and this was the perfect place. This house is absolutely beautiful. 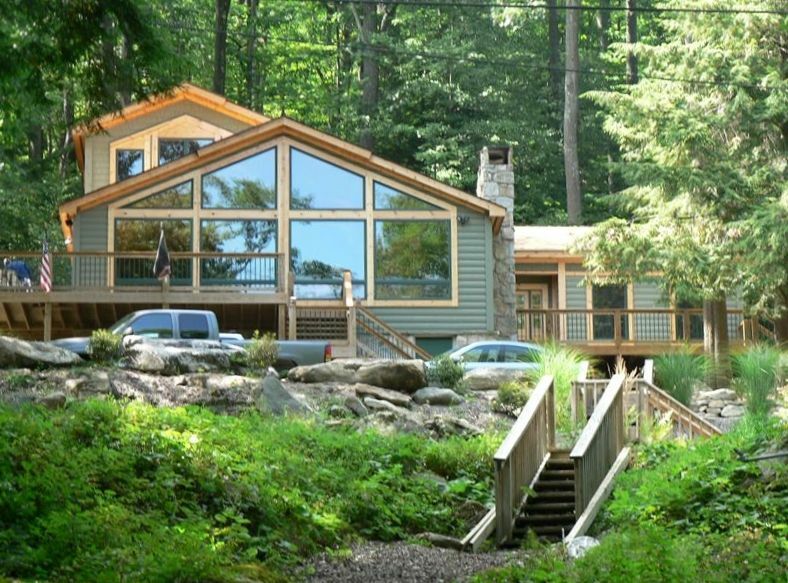 The entire front of the house is glass and looks out over the lake. It was wonderful to watch the snow fall...oh so peaceful, even with four kids running around. Very spacious, up to date, and loved the wood burning fireplace. Made it an official winter retreat. It was a hop skip and jump away from Wisp, which is the main reason we chose this location. Would love to come back during the summer and take advantage of the lake and golf. Highly recommended for families!!! Joyce, so glad you enjoyed the house. We would love to have you back in the summer. Deep Creek is a true 4 Season Resort. The summer months offer all lake watersports as well as flyfishing, kayaking and white water rafting on the Youghiogheny, Savage or Casselman Rivers. Golf at the Wisp Resort or several other challenging courses within a short drive. The Fall is a wonderful time for Autumn boating and exploring the many State parks. Winter offers downhill and cross country skiing at the Wisp Resort. Ice fishing and snow mobiling are enjoyed by many. You have the option to bring your own linens or to have linens supplied by a linen service for $100. Please text or email to set-up the linen service. Steve 703-853-9320 or gcb@garnercb.com The Summer rate period requires full week rentals.